Let's start with general genetics: "What is DNA and what is for?" and "How could we be apparently so different among us but at the same time the same species?" The DNA is our particular library, essential for life. 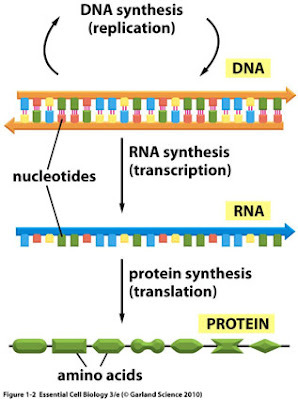 We have all the necessary information encoded in a combination of four nucleotides (A, T, G and C). This library has hundreds of books, which we are going to call RNA. We have a lot of different kinds of RNA, which maybe is boring and not what you are looking for at this blog. So let's say that this RNA should be translated into proteins to be useful for a cell. These proteins will work independently or as a subunit of a big complex to make what is required. Please, I encorage you to watch this video from the BBC that explains easily and completely what is DNA and how it works. After this very very very brief summary, let's ask the second question. Why are all of us so different among each other? Sometimes we think that Genetics is everything. That depending on our genome we are encoded to suffer a disease or to be fatter or stronger. But let me say that this is completely untrue. There is one very important thing that all biologist must know: The phenotype (or external aspect) depends not only on the genotype (internal genetic code), but also on the environment. As an example: you can have propensity to diabetes by your genes, but if you follow a healthy way of life you will have less probability to suffer it. In other words, you could find somebody genetically exactly equal to another, but phenotypically different, and vice versa.